Time for a break from the heat, and after a season of full-time AC usage, it’s also a good time to power down your home’s energy consumption. What is the rule of thumb for spacing recessed light fixtures? I’m finishing my basement, and would like to install energy-efficient LED recessed lighting. The unfinished ceiling height is just under 8 feet. The spacing will depend on the fixture and the amount of light that you want to have. At a distance of 8 feet from the ceiling to the floor, the footcandles will be 6.9 footcandles, and the beam diameter will be 11.9 feet. Footcandles are the measurement of the amount of light when it reaches a surface, and a footcandle level of approximately 10 is not unusual for general circulation in many homes. If you place the fixtures approximately 12 feet apart, you will have about 7 footcandles directly below the fixture and at the point where the beams intersect. Therefore, to increase your footcandle levels, you might want to use an 8-10-foot spacing. Replace dimmable incandescent bulbs with dimmable CFLs. While CFLs still do not have the dimming range of incandescents, the technology has come a long way. Buy name brands. They will last longer and look better. Make sure your outdoor lighting is energy efficient. Look for outdoor fixtures that use either CFLs or light-emitting diodes (LEDs) and that are motion sensor or photocell activated. Buy Energy Star-qualified fixtures and bulbs. This means they are certified by the U.S. Department of Energy as energy efficient. Retrofit recessed lighting with LED fixtures. It’s easy to replace recessed fixtures with super energy-efficient LED versions, and while costly, LEDs will last many years. Replace undercabinet lighting. LED strips and pucks are easy to install and five off less heat than incandescent. Find beautiful & energy-efficient LED fixtures at Hortons Home Lighting. 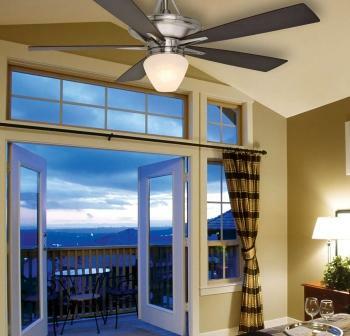 September 18 marks the first annual National Ceiling Fan Day (NCFD). More than 20 ceiling fan manufacturers, the ALA and leading energy conservation groups invite everyone to join the fight to reduce energy consumption by turning off their central cooling systems and relying on ceiling, floor, desk and wall fans to save trillions of kilowatt hours of energy consumption. If every American relies on fans instead of their home air conditioner for just one day, the resulting energy savings will be enough to power the entire city of New York for months. Not only is using a ceiling fan good for the environment, it’s good for your checkbook too. Operating a fan can cost as little as $1 per month. That is quite a savings compared to approximately $100 per month to run an AC unit in a typical home. Data published by General Electric.